Top features:- More efficient cleaning with ecobubble technllogy - Wide range of wash settings - Stay Clean Drawer minimises mess - Easy problem solving with Smart Check - Diamond Drum protects your clothes Clean clothes more efficiently with ecobubbleSamsung's ecobubble technology creates bubbles of detergent, water and air that give your clothes a really deep clean. The ecobubbles work fast, which means you can put a wash on at a lower temperature, saving energy and keeping clothes in great condition.Bubblesoak can be added to any of your programs, letting the ecobubbles attack tough stains on cottons, synthetics and baby clothes.Wide range of wash settingsA wide range of wash settings have all your washing needs covered - from baby care to denim. There's a handy 15 minute quick wash for when you need that special garment washed fast.Stay Clean DrawerWith a Stay Clean Drawer your days of wasted detergent and having to clean out the drawer are over. Clothes receive a very thorough wash thanks to a more efficient transfer of detergent to the drum. 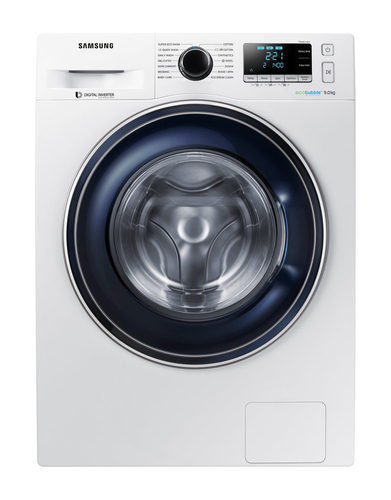 Any residual detergent is blasted away by powerful jets of water.Problem solving with Smart CheckSmart Check automatic error-monitoring system finds any problems with your washing machine and sends you troubleshooting options direct via a smartphone app. So no need to go leafing through the manual or calling an engineer.Diamond DrumSamsung's unique diamond embossed drum stops your clothes from snagging during a wash. The Digital Inverter Motor means less noise, less vibration and less wear and tear.